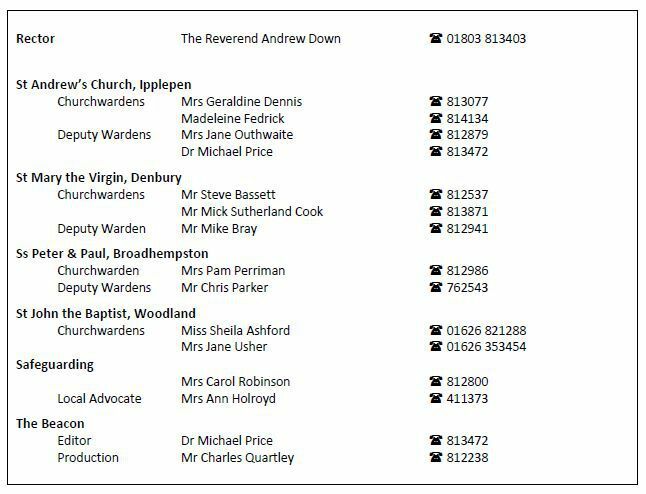 For contact details for the Rector and Churchwardens, click on image below. To send an email, fill in the Contact form. The April - May 2019 Beacon magazine contains all of the usual news from the Mission Community. The Beacon Parishes Mission Community Profile and Vision and Mission Action Plan documents - updated for 2017 to reflect the Diocesan Vision - are now online under ABOUT US - MISSION ACTION PLAN. 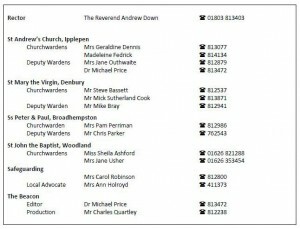 Click on the link below for St. Mary the Virgin, Denbury for news of their Bell Restoration Appeal. The Ipplepen Annual Report for 2018 is now available - click on the link below for St. Andrew's. Read all about the conservation of the Torbryan panels by following the link below to Holy Trinity, Torbryan.